With the new Homey Smartphone App and Homey v2.0.0 around the corner, we have the unique chance to rethink some decisions we have made a long time ago, and see if they still hold up. This blogpost focuses on speech and music. Our plans for them will be explained below. We are very good, maybe even the best, in points 1 to 4. Point 5, speech recognition, has always been a little bit troublesome, and has been experimental for as long as Homey is available. In the meantime, tech giants such as Amazon, Google and Apple have successfully created a speech interface that we couldn’t match. In retrospect, to create a reliable speech-to-text service is impossible for any startup. Due to the fuzzy nature of the problem, a lot of data, people and users are needed to create a service that is reliable and fast enough for daily use. However, what these companies did not solve is the problem that smart devices still don’t interconnect. They are great for fast commands, e.g. ‘Turn off all lights’, yet are cumbersome for those who want a little more functionality and many more brands of devices. As a company you continuously have to make decisions on where to put focus. Speech recognition hasn’t been proven to be our strong suit, but home automation more than ever is what we’re good at. While the decision was emotionally incredible hard to make, rationally it was very easy. 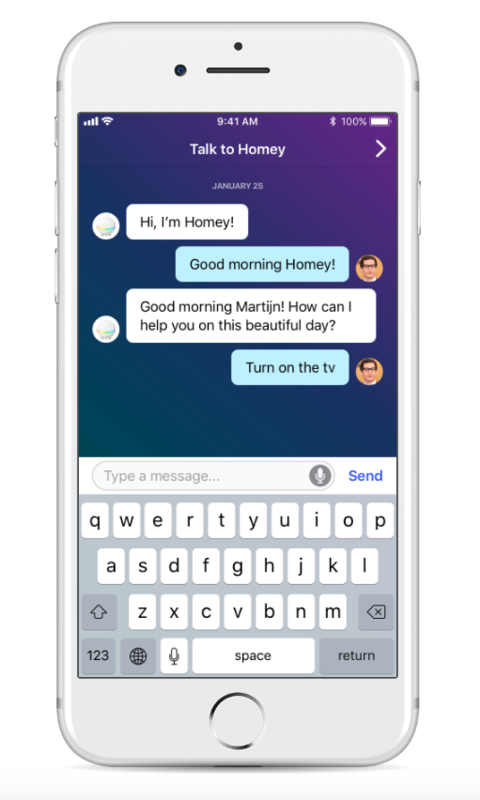 We have therefore decided to not focus on improving the speech recognition of Homey anymore, and instead will utilize the speech interfaces of Amazon and Google. To be clear; we are not abandoning speech completely. Homey still has a brilliant speech interpretation engine, which is used when using Chat in the new Homey Smartphone App, when saying “Alexa, ask Homey to …” and “OK Google, tell Homey to …”. Talking to Homey itself will also still work, but as of Homey v2.0.0 this experimental feature must be enabled manually for new users, to emphasise that it isn’t fully stable. For the remainder functionality, we have already integrated the Alexa Smart Home skill, which enables direct control such as “Alexa, turn on all lights” for all your Homey-connected lights. The Google Assistant smart home integration will soon follow as well. Simply put, we wanted a voice-controlled home with support for all smart devices. We underestimated the amount of work to solve speech, and are glad that this has been solved by other companies. From the moment we started developing Homey, we noticed users wanted multiroom speech recognition. This can now be realised with the products by companies such as Google and Amazon. That leaves the smart home to Homey, accompanied by an Amazon Echo or Google Home for those who want (multiroom) speech. You can check out all the possibilities with speech integrations here. One lesson we’ve learned over the years is that every well-designed product goes through the same cycle. Whether it’s electronics, an artwork, code or even how you decorate a home, it’s all the same. Initially you have a vague idea of where you want to end up, and start building and solving problems once they appear on the road. The second step is a massive solution with too much dependencies, tiny solutions everywhere, too many features – but it does the job. The last step is to figure out what you actually wanted in the beginning, and to reduce the mountain of work you did to the most simple and elegant solution possible to still solve the problem. You can then start to clean up rarely used features and make it easier to use for everyone. This is where we are now. We introduced Homey Music about a year ago. The problem we set out to solve was to play music from various sources to various speakers. But to be completely honest, it has never worked as smooth as we wanted it to. The first lesson we’ve learned was that not so many people actually use this functionality of mixing playlists. Eventually the most requested feature was to simply play music from a single source, e.g. Spotify, on a speaker automatically. And looking back, that has always been what we’re good at: automation. At least way better than at creating a music application. The next thing we’ve learned was that music services weren’t too happy with our approach. We did not get access to their streaming services, mostly because they didn’t share our vision of free choice of services and speakers. These two drawbacks made us decide to make Homey Music much more simpler. As of Homey v2.0.0 music service apps will be unsupported, and instead we will focus on devices solely. For example, a Spotify Connect speaker can be paired, and playback can be controlled with the Homey Smartphone App. 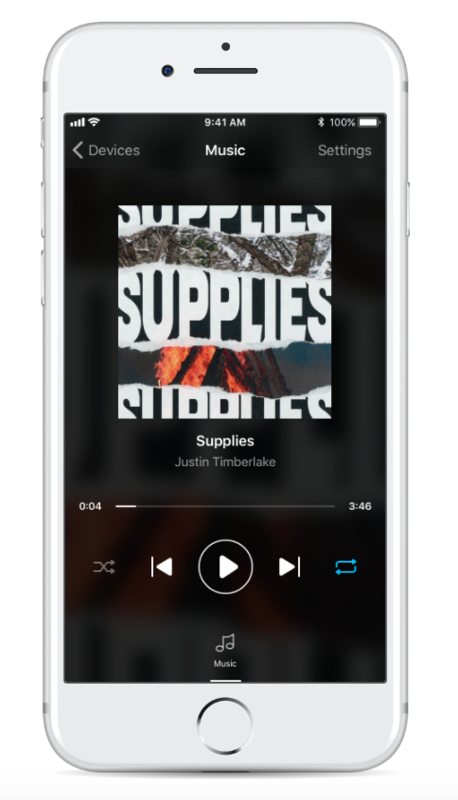 Using a Flow, playing specific songs, playlists or artists can be automated. But searching and managing your playlists from within our app on the go will be removed – we think the service’s own app will always be a better experience for this. Summarised, that’s about 10% of the work for 90% of the possibilities. It’s never easy to undo any work you did, yet we accept that it’s a part of the design process of creating an amazing product that does its job well. With these two choices, we have created more focus for our company and have more hours to spend on things that matter — Connecting everything at home.